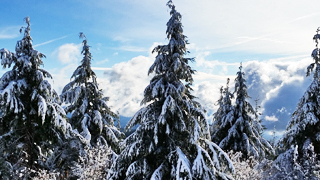 Can you believe it!…..Seattle actually had a White Christmas. For those of you in other parts of the world, you may think what’s special about that? The National Weather service places the odds of having one at 7 percent. The last White Christmas Seattle had was 9 years ago. Before that it occurred in 1926. It’s the 7th time in recorded history. 3 times in 100 Years!….Those are long odds. 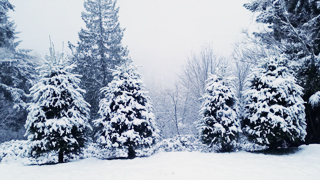 For those that love snow – It was great to see it on Christmas. For those that hate snow – We only got a few inches. For those that need a comparison to put things into perspective – Erie, PA got 34 inches..all on Christmas Day. Our neighbor to the South, Portland, Oregon received a white one too – It was the 6th time they’ve had a White Christmas since 1884. At West Tiger, 3000 feet above Seattle, your chances of a White Christmas are significantly better. I took this on December 4th, standing on the porch of the transmitter building. If any of you wonder why I prefer to travel to West Tiger mountain, the beauty in the above picture will help explain things. Yes, I know, most of you would rather be stuck in traffic on a freeway with a great view of the back of a big smelly truck. Speaking of being stuck in traffic, the major rail accident near DuPont certainly created a mess in this area. I-5 in this location, is what engineers call a SPOF – or single point of failure. Lose that piece of highway and you have a mess. Could not help but notice how four of the local TV operations were all over this one with great coverage. Several radio operations did a great job also. What was really obvious is the fact that many (apparently) don’t pay attention to broadcast outlets providing traffic information as underscored by the fact that there were often 5 mile backup’s on SB I-5. What were these folks doing that would cause them to sit in a 5 mile backup just to be turned around? My guess is that their car radios were either turned off, or they were listening to radio stations that could care less about broadcasting traffic information. (That could include Satellite Radio) Wonder if anyone will study this aspect?…..Probably not. A recent survey showed that 73% of Americans subscribe to Netflix…and that’s the same percentage that subscribe to Pay TV. Guess that explains a lot! No wonder Comcast is pushing their broadband business. I presume that that segment is more than making up for the lack of TV customers? Well Entercom made their first move by switching Country KMPS to Christmas Music…Then on the morning of December 4th they made their 2nd format move switching 94.1 to a new soft AC format and re-branding the station ‘The Sound’. Now sporting the call letters KSWD. Meanwhile, over in Bellevue….Moments after 94.1 switched from Christmas to AC, Hubbard switched their 98.9 to Country. Its pretty obvious what took place there – 1) Hubbard gambled that Entercom would not keep 2 country format stations in the same market and, in the couple of weeks that 94.1 played Christmas, readied their country format – just in case. Or 2) Some at Hubbard knew what Entercom was going to do ahead of time. Normally format changes are closely held secrets, perhaps not this time? The part that few thought would happen was Entercom throwing away 94.1’s many years of being the country place in Seattle and keeping their own country station (100.7) that was behind in the numbers race. History shows that something similar took place years ago when the owners of KMPS purchased another station in town that was playing country music. In that case, the new owners made their former competitor go away. 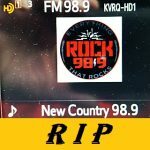 Now 100.7 will be the senior country station (they’ve been at it a while) and 98.9 will have to play catchup. Certainly, the next ratings numbers will be interesting. On the technical side, the transmitters for 94.1 and 98.9 are a few feet away from each other and they both transmit thru the same antenna. It was interesting looking at my radio the Monday morning when all this was going on. As in most of these cases, engineers are kept ‘out of the know’. As a result, some of the textual information was a bit behind the changes. Entercom was calling themselves ‘The Sound’ but the art-work (for a while) still showed the red and blue KMPS Guitar. 98.9 suffered the same problem – as you can see from this shot of my radio – (excuse the lint on my radio’s display). Here we see that 98.9 is ‘Everything that Rocks’ and ‘New Country’…hmmm? There’s a whole lot of movement going on in the Seattle-Tacoma area, but we’re not talking about earthquakes…It’s radio programming…Going to take a while for all of the dust to settle. Another ownership change is in the works, this time to 103.3/KMCQ, the FM licensed to Oak Harbor. The new owner will be Busto’s Media who operates 99.3/KDDS and 1210/KMIA. This will likely mean that Country Music fans will have to deal with another change as the station is certain to be changing to a Latino format of some kind…No word on the fate of the call letters. Interesting that the call KMCQ came to the Seattle area with the move of the station from Oregon that later became KLSW. Bustos has been busy of late with CP’s recently being granted for new FM operations in Portland, San Jose, Houston and Ephrata. Another new FM in the area will be in Puyallup on 94.5 Licensed to Jean Suh who operates the Korean language operation on 1450 AM there as well as 1230 in Everett. This will be the second FM in the area on that frequency that used to be pretty much exclusively KRXY a Class A operation in Shelton. The other is the KTTH(AM) translator on Cougar Mt near Bellevue. A whole lot of press being given the recent FCC decision to repeal the 2015 rules commonly called Net Neutrality. Here, Washington State, is apparently going to take the matter to court once again proving that the real winners will be the lawyers. Question for you – What Pacific Northwest City has more breweries than any other city in the world? If you guessed Portland, Oregon you’d be right! For those of you that don’t get to visit Tiger Mountain, I should explain that there are 6 summits in the Tiger Mountain State Forest. Three of them have electronic equipment on them. In this view we are traveling from West to East looking at East Tiger Mountain, the highest of them all. There are no broadcast stations on this Tiger…just lots of Microwave and other electronic communications equipment. The big tower on the top also belongs to ATC. Apparently the temptation to operate a radio station with too much power is not limited to commercial operations. I’ve been reading about a number of instances where an LPFM is operating with excessive power. Pretty easy to buy a transmitter for any power level your budget will permit and just – turn ‘er up. Perhaps the lack of routine/surprise inspections by the FCC contributes to this problem? Licensed full power stations that could be impacted by this practice would be wise to keep an eye on these kinds of issues to protect themselves. On the topic of FCC Violations – the Commish has sent a letter to the operator of an AM station in Carthage, Illinois, telling him to turn it off because he does not have a license. In this case running about 1,000 watts on 990. This is not your typical pirate that ends up on the air out of the blue, but rather a broadcast station owner that was denied a renewal for failing to pay a debt to the FCC. Frankly I’m surprised there are not more pirate AMs. Guess this helps underscore the fact that AM is not all that desirable these days. Even the pirates don’t want to operate there. Perhaps the biggest hard-luck story of 2017 for Broadcasting will be the fact that Cumulus filed for Chapter 11 Bankruptcy. Cumulus is a sizable operation, in fact, in terms of number of stations, they were ranked #2 in the U.S with 446 stations in 90 markets. It has been reported that some $5 Billion was spent building the company. Perhaps one could write a book based on the Cumulus story. Now some will get their money and some will not. This is all about what’s called – Debt Restructuring – a process of winners and a lot of losers. For those that loose – you have the option of getting a tax break for a bad-debt. Will have to see how this all shakes out. Certainly not a pretty picture, viewed by many as a black mark on the radio industry. Inside, it’s likely to be a challenge to keep a smile going forward. ‘Tis not the first time a company has gone Chapter 11, but perhaps the first time a big operation like this has done it. And in a stroke of bad-timing, several Cumulus stations in South Carolina were informed by the FCC that they are proposing a fine of $20,000 for EEO violations. Wonder if the FCC can collect? Cumulus is not a big name here in the PNW because they have no operations in the area’s major markets. They do operate clusters of radio stations in Eugene, Oregon, Boise, Idaho and Colorado Springs. In each of those markets they have 4 FMs and 2 AMs. Perhaps the most famous operation in this neck of the woods is KBOI in Boise, a 50 kW big signal on 670. Cumulus is based in Atlanta. Meanwhile, iHeartMedia continues to do ‘the bankruptcy avoidance dance’ with their creditors. iHeart, compared to Cumulus, has some really serious debt…Like $20 Billion worth. Would be interesting to be a fly on the wall in some of these discussions. Like Cumulus, there will be winners and losers. The $64,000 Question is will the company be forced into bankruptcy or will they, again, be able to pull the proverbial rabbit out of the hat? Perhaps in 2018 we will all learn how this chapter of the saga will read. This far, there appears to be a good supply of rabbits. Speaking of Saga…in this case a much brighter story as Saga Communications is giving their shareholders a special cash dividend on top of their normal one. The company has, reportedly, paid out almost $53 million in dividends to their stockholders since 2012 and is saying they plan on continuing to do so. 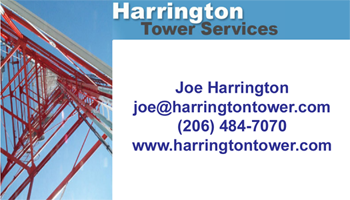 Saga owns 75 FM and 33 AM stations including a cluster in Bellingham, WA. Kudos to Saga for proving that it is possible to make money with Radio. Part of the recent iHeart/Entercom/CBS shuffle involved the old 102.9/KELA-FM on Capital Peak. Until recently the call letters on the station were KFOO, now changed to KFNY. One of the trades mentioned this shuffle and called the area served as Centralia/Tacoma. I have to admit I was a bit taken back by the lumping of those two locations together. The City of License for 102.9 is Centralia. This brings up the question, with the Main Studio Rules going away in January, it is not time to do away with the City of License criteria also? Here in the Seattle area, we have a lot of stations that identify with the Seattle area, whose city of license is a city other than Seattle. Look at Television – Channel 11 and 13 are licensed to Tacoma. Granted the FCC allowed dual city IDs a long time ago. FM Radio is another example – 106.1, 97.3, 103.7 etc. all have a COL of Tacoma. (This is why when you hear KIRO-FM do their ‘Legal ID’ they always say “ KIRO-FM, Tacoma, Seattle’. Then there are stations like 97.7/KOMO-FM – whose City of License (COL) is Oakville. You will hear this once in a while as they do their Legal ID. Another is 99.3/KDDS. Their COL is Elma. How about 106.9/KWRM? Their COL is Bremerton. Is the whole City of License thing just as out of date as the Main Studio Rules? If you don’t have to have a Main Studio in your City of License….Why should a broadcaster be forced to Identify the COL on the air? Allow me to pick up KOMO for a moment. Who benefits from having the station say Oakville once an hour? What purpose does It serve other than to keep the Commish happy? Whereas broadcast stations (today) are no longer based on a specific location but are based on where their coverage contours fall in respect to co-channel and adjacent channel technical considerations, why not drop the dated COL requirement altogether and permit broadcasters to identify with any city whose boundaries are totally within the coverage of the station? Another example of the FCC ‘funky thinking’, how is it that a translator can identify with a city that is many miles away? Where is the logic here? Mike held a BS in Electrical Engineering from Virginia Polytechnic. one. A memorial has not yet been scheduled. Tegna, owner of many major TV Stations, including operations in Seattle, Portland, Spokane, Boise and Denver recently announced they were purchasing KFMB-TV in San Diego. Included in the purchase is the KFMB AM and FM Radio Stations. They stopped short of saying that Cellphones are dangerous. A huge number of law suits from those that would blame everyone because they were not warned. This is a classic case of convenience vs. implied danger, and we all know how well that works. 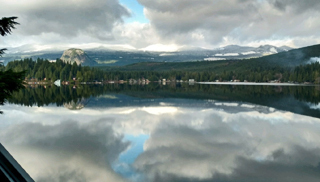 In my work with WSU’s NWPR (Northwest Public Radio), I frequently drive over to Forks, WA. For those of you not familiar with Forks, it’s near the NW Corner of Washington State and is more recently known as the setting for the Twilight series. With just under 4,000 residents, Forks is like other little towns near the Washington Coast that were once thriving along with the lumber industry. To be honest, the little place is not exactly thriving, with about 20% living with incomes under the poverty line. It’s beautiful country, green and lush and near the north Washington Coast. You have to like rain to live there with well over 100 inches of it falling annually and reportedly 212 days a year with measurable precip. In terms of broadcasting, there are no OTA TV stations, but there are several receivable radio stations, some from Canada. Locally, there is an AM/FM station as well as two signals from NWPR (why I go there) and a couple low powered FMs. Recently an application was filed for a new translator on 94.1. Not sure, at this writing, what it will be repeating. 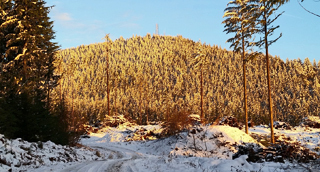 Seattle broadcasters are not heard, thanks to the blocking of the Olympic Mountains. Median home listing price – $675,000, equal to a monthly mortgage payment of over $3000. Median household income – $70,000. According to Zillow, the median home price has gone up $100,000 in the PAST YEAR. The average time a listing in King County is on the market is – 8 Days! A typical home in King County now sells for twice the national average. Two-third of all sales in King County this year have had a “bidding war”. There is no egg in eggplant. No apple nor pine in pineapple. No French fries in France. Sweetbreads, which aren’t sweet, are meat. And why is it that writers write but fingers don’t fing, grocers don’t groce and hammers don’t ham? If the plural of tooth is teeth, why isn’t the plural of booth, beeth? One goose, two geese. So one moose, two meese? One index, two indices? Doesn’t it seem crazy that you can make amends but not one amend? If you have a bunch of odds and ends and get rid of all but one of them, what do you call it? Here’s a name that many of you will recognize – Matt Granard. Matt and his family were known as owners of Westlake Electronics, who, when they were on Westlake in South Lake Union area, was a place where broadcast engineers would shop for parts to keep their stations going. (Miss those days.) Matt is now with Costco. Thought I’d never hear it. Charles Osgood has announced that he is retiring at the end of 2017. CBS Sunday morning and the Osgood File will never be the same and another legend in broadcasting moves on. The reason was cited as being a health issue, adding that his doctors told him it was time after almost 50 years. Osgood is 84 and started in the business back in 1967. It was recently announced that Broadcast Electronics has been acquired by an Italian firm, Elenos. BE started out in the late ’50s with another name – Spotmaster, a manufacturer of audio cartridge tape equipment utilizing a Viking deck (oh, how I remember). The firm moved from Silver Spring, MD to Quincy, Ill – then home of Gates Radio. In the late 70s they started making transmitters. I recall when 88.5 FM was installing their new BE Transmitters at West Tiger, that some of the items arrived in boxes labeled ‘Spotmaster’. They did quite well for a number of years with many of the radio signals you hear on the air in the Seattle area coming from BE Transmitters. Later the firm got into software for Radio with their Audiovault product. Along the way they purchased Marti Electronics. Recent years have not been kind to the firm with several ownership changes. Reportedly, only about 50 people are working at their Quincy facility. A lot of conjecture as to what Elenos will do as the new owner. 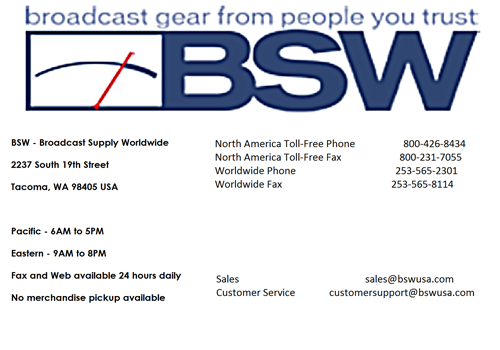 Certainly interesting that an off-shore firm is buying a US broadcast equipment manufacturer. Looking for a job in this business? As you likely know, Europe is leading the way in replacing conventional AM and FM Broadcasting with Digital systems, commonly called DAB. Norway is one of the leaders in this movement with the announcement that they are the first country in the world to shut down their national broadcasts on the FM Band. There are still signals on FM however, but nothing like North America. Sinclair, owner of two TV and three Radio Stations in Seattle, and a major broadcast owner who is seeking to absorb Tribune, was recently slapped with a huge, over 13 Megabuck fine for violations of the FCC’s sponsorship ID rules. The rule states that you must, in the case of a paid program, identify who is paying for it. Sinclair claims it was an oversight. Will see if this gains any traction with the regulators. Not good timing for a firm asking that the FCC approve a transaction that is being opposed by several. Not exactly creating a lot of headlines, but the long-running radio program A Prairie Home Companion is getting a new name, apparently as a result of the program’s long time, and recently retired, host being accused of personal wrong doing. The new name will be ‘Live from Here’. Another AM is going dark. This time legendary KQV in Pittsburgh. Apparently the owners have concluded that they are unable to sustain the rather labor intensive and expensive news operation. Announcing that the station would be silent at the end of the year makes me suspect that they have tried to sell it and have not yet found a suitable buyer. No word on what will happen to the 1410 AM operation in the future. KQV goes back almost 100 years having begun broadcasting in 1919. You will have to look very closely at this picture. Perhaps some of you will recognize a very much younger Clay Freinwald. 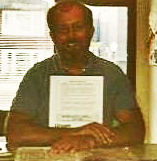 I know the location…the front desk of KNBQ at 11th and Grant in Tacoma. The date would be in the 1980s (perhaps). Gee I had hair – and would you look at the color of that beard! Since I first started writing this Column, way back in 1986, a lot of things have changed. Initially I wrote it on my computer (Apple II) and sent it to the Seattle SBE Chapter 16 publisher via, very slow, modem. They would then insert it into a file that became the Chapters Newsletter ‘The Waveguide’ which was mailed with its famous Yellow cover. Along the way it became clear that the labor of printing, mailing and the expenses involved, were being replaced with the advantages of On-Line distribution. At this point, The Waveguide, and my Column, was instantly available to anyone that wanted it. This was when things started getting interesting. I discovered that the Denver SBE Chapter was running my Column…and others were quoting it. It became clear that my Column was no longer just a Seattle SBE thing. I then began emailing it to not just the Seattle SBE Chapter Waveguide Editor, but to other SBE Chapters and, of course, to the publisher of Northwest Broadcasters. It was interesting to note how, within a few hours of being posted on the NW Broadcasters site, the December issue was being mentioned, and linked, to the Seattle version of radiodiscussons.com. When you write something today, and it gets posted, you need to be mindful that your writing could end up and be read anywhere. I am amazed at the geographic distribution of my readers. Every month I receive comments and pictures from all over. I want you to all know that I appreciate it. There is nothing worse than the thought that what you write is not being read by anyone! I appreciate the feedback (even when I am wrong). I especially appreciate the submission of pictures and short stories about happenings in other areas. Hopefully my readers here in the Seattle area do too – so keep ‘em coming. This, perhaps, brings up the question of how long will I do this? All I can say is that I do enjoy it, and would like to do so for a while longer. Age, however, has a way of creeping up on us all and at some point I will either expire or retire. If I have the option, I will certainly want to say goodbye. Having a 30+ year run is certainly an achievement. With that being said, Thank You for reading my stuff. Before I end this – Some items that came to me from my brother in law (who is younger). My people skills are just fine. It’s my tolerance for idiots that needs work. These days, “on time” is when I get there. Wouldn’t it be wonderful if we could put ourselves in the dryer for ten minutes, then come out wrinkle-free and three sizes smaller? Lately, I’ve noticed people my age are so much older than me. “Getting lucky” means walking into a room and remembering why I’m there. Some days I have no idea what I’m doing out of bed. Aging sure has slowed me down, but it hasn’t shut me up. I still haven’t learned to act my age. Well, my friends, that’s it for this month. I hope that 2017 was good to you and yours and that 2018 will be even better.